CRGV is a dog disease that has been known about since 1988 (Walker 2014e, Walker 2014d, Walker 2014a, Walker 2014b). The first UK CRGV cases were observed in November 2012. Up to December 2014 there have been 65 recorded cases: 46 confirmed dog deaths, 12 unconfirmed deaths and 7 unconfirmed cases where dogs survived – 89% mortality rate (Street 2014c). In October 2014 35 unconfirmed dog deaths were cited (Walker, Sherwood 2014) totalling 88 cases – 92% mortality rate. TMA (Noris, Remuzzi 2010, Richards, Kavanagh 2009) is three different diseases: typical Haemolytic Uraemic Syndrome (HUS) is caused by Shiga toxin-producing Escherichia coli (STEC-HUS) – tests for E.Coli and shiga toxin have been negative (Walker, Sherwood 2014) ; aHUS is associated with genetic or acquired disorders of regulatory components of the complement system; thrombotic thrombocytopaenic purpura (TTP) results from a deficiency of ADAMTS13, a plasma metalloprotease that cleaves von Willebrand factor (Noris, Mescia et al. 2012). In humans, Plasma Exchange (Plasmapheresis) treats TTP, STEC-HUS & aHUS (Yenigun, Bardak et al. 2012, Ponticelli, Banfi 2006, Carter, Benador 2014). In April 2014 the first dog to be treated by Plasma Exchange for CRGV – survived (Glennie 2014). However Plasma therapy is very risky; up to 40% of humans die or progress to end-stage renal failure (NICE 2014b). Targeting of complement with the anti-C5 monoclonal antibody Eculizumab can effectively treat not only aHUS (for which it is indicated), but also STEC-HUS and TTP (Noris, Mescia et al. 2012). 3 types of Eculizumab reviews are listed: Biochemistry (Zuber, Le Quintrec et al. 2011, Kerr, Richards 2012); Use in TMA treatment (Noris, Remuzzi 2013, Pickering, Cook 2011, Waters, Licht 2011, Keating 2013, Keir, Marks et al. 2012, Rathbone, Kaltenthaler et al. 2013) and; Case reports (Zuber, Fakhouri et al. 2012). Approval for the treatment of aHUS by Eculizumab in the United States and Europe in humans was given in 2011 (Schmidtko, Peine et al. 2013). Eculizumab is thirty times more expensive than other monoclonal antibodies (Laurance 2013, Stanton 2014). NICE recommends cost reduction in humans by dose reduction and stopping treatment early (NICE 2014d). Despite the high price (NICE 2014c), after a NICE evaluation in October 2014 (NICE 2014b), the final draft NICE guidance in November 2014 recommended NHS England fully fund Eculizumab to treat aHUS. The final NICE guidance to NHS England is due January 2015 (NICE 2014d). Until the final guidance is published, the current NHS England policy about Eculizumab for aHUS in humans applies (NHS 2013). 170 people in England with aHUS will be treated with Eculizumab at £340,200 per patient per year. NICE suggest that NHS England budget £57.8M for Eculizumab in year 1 rising to £85M in year 5 (NICE 2014d). Interestingly, 20 – 30 new patients are diagnosed with aHUS each year (NICE 2014d) – a similar number to the new CRGV cases in dogs (65 – 88 cases November 2012 – December 2014). Each 30ml Eculizumab vial contains 300mg (Soliris 2014) and costs £3150 per vial (NICE 2014d). Assuming dogs average 10-20kg, cost per dog is £88,200 per year. A £2.64M budget would allow 30 dogs to be treated in the first year. Does CRGV have a specific environmental trigger or does it occur randomly? I suggest statistical analysis by (Spiegelhalter 2015) on the 25 confirmed cases in clusters (Street 2015). When stakeholders are reasonably confident that CRGV is an aHUS TMA, I propose that a coalition group is formed similar to aHUS Action (aHUS 2014) and other professional groups (NICE 2014a). The group would campaign for a grant from Alexion Pharma UK, (Alexion 2014) to treat dogs with Eculizumab over a trial period. If the trials are successful, the group would campaign to get funding for Eculizumab treatment in all dogs with CRGV; in a similar manner that people with aHUS should get full funding through NHS England Specialised Commissioning Services (NHS 2012, NICE 2014d). 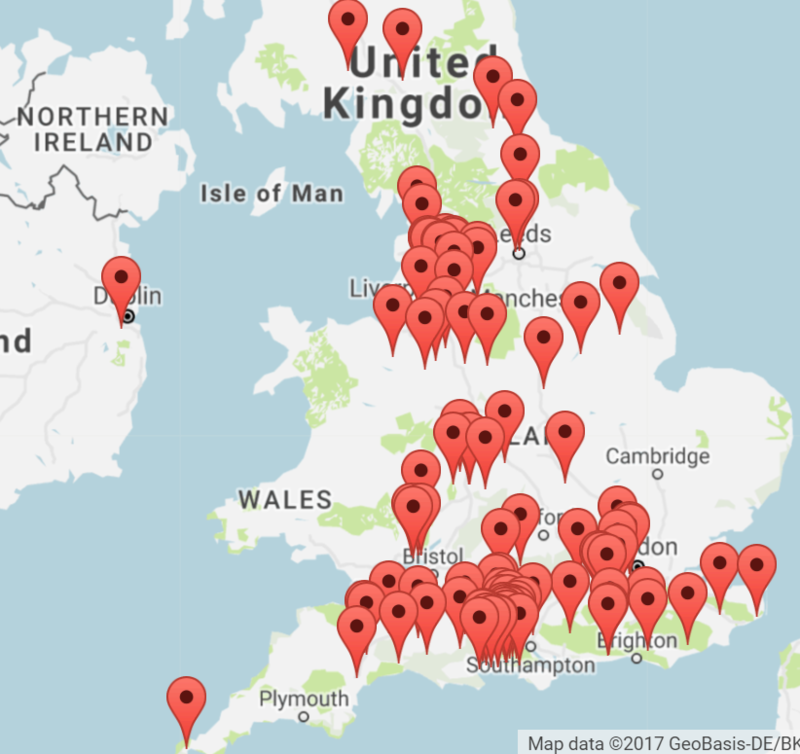 AHUS, A., 2014-last update, aHUS Action is a coalition campaigning for better NHS care for patients with atypical haemolytic uremic syndrome (aHUS) in England. Available: http://www.ahus-action.org/ [December 31st, 2014]. ALEXION, U., 2014-last update, Alexion UK website from Alexion Pharmaceuticals, Inc. Available: http://alxn.com/SelectCountry/UK.aspx [January 3rd, 2015]. CARTER, C.E. and BENADOR, N.M., 2014. Therapeutic plasma exchange for the treatment of pediatric renal diseases in 2013. Pediatric Nephrology, 29(1), pp. 35-50. GLENNIE, A., 19th August 2014, 2014-last update, Doggy dialysis: 11-month old Labrador is first to survive mystery disease that killed dozens of family pets after pioneering treatment at London animal hospital. [Homepage of Daily Mail], [Online]. Available: http://www.dailymail.co.uk/news/article-2728894/Dog-dialysis-London-animal-hospital-pioneers-cure-mystery-disease-killed-dozens-family-pets-long-walks-country.html. JEPSON, R. and JASANI, S., 2014. Podcast: Alabama Rot-like Syndrome in UK dogs. 14th April 2014 edn. http://www.rvc.ac.uk/small-animal-referrals/news-events/clinical-podcasts/15-alabama-rot-like-syndrome-in-uk-dogs: . KEATING, G.M., 2013. Eculizumab: A Review of Its Use in Atypical Haemolytic Uraemic Syndrome. Drugs, 73(18), pp. 2053-2066. KEIR, L.S., MARKS, S.D. and KIM, J.J., 2012. Shigatoxin-associated hemolytic uremic syndrome: current molecular mechanisms and future therapies. Drug Design Development and Therapy, 6, pp. 195-208. KERR, H. and RICHARDS, A., 2012. Complement-mediated injury and protection of endothelium: Lessons from atypical haemolytic uraemic syndrome. Immunobiology, 217(2), pp. 195-203. LAURANCE, J., 26th May 2013, 2013-last update, At what cost? Life-saving drug withheld [Homepage of The Independent], [Online]. Available: http://www.independent.co.uk/life-style/health-and-families/health-news/at-what-cost-lifesaving-drug-withheld-8632371.html. NHS, E., September 2013, 2013-last update, Clinical Commissioning Policy Statement: Eculizumab for atypical haemolytic uraemic syndrome (Reference: E03/PS(HSS)/a) [Homepage of NHS England], [Online]. Available: http://www.england.nhs.uk/wp-content/uploads/2013/09/e03-hss-a.pdf [January 3rd, 2015]. NHS, E., 21st November 2012, 2012-last update, New national model to tackle variation in specialist healthcare services. Available: http://www.england.nhs.uk/2012/11/21/spec-services/ [January 3rd, 2015]. NICE, O., 24th October 2014, 2014a-last update, Atypical haemolytic uraemic syndrome (aHUS) – eculizumab [ID703] [Homepage of NICE.org], [Online]. Available: https://www.nice.org.uk/guidance/indevelopment/gid-atypicalhaemolyticuraemicsyndromeahuseculizumab [January 3rd, 2015]. NICE, O., 6th October 2014, 2014b-last update, Atypical haemolytic uraemic syndrome (aHUS) – eculizumab: evalution consultation document 2 [Homepage of NICE.org], [Online]. Available: https://www.nice.org.uk/guidance/gid-atypicalhaemolyticuraemicsyndromeahuseculizumab/documents/atypical-haemolytic-uraemic-syndrome-ahus-eculizumab-evalution-consultation-document-2 [December 30th, 2014]. NICE, O., 4th March 2014, 2014c-last update, High cost of treatment for rare blood disorder needs to be clarified, says NICE in draft guidance [Homepage of NICE.org], [Online]. Available: https://www.nice.org.uk/news/press-and-media/high-cost-of-treatment-for-rare-blood-disorder-needs-to-be-clarified-says-nice-in-draft-guidance [December 30th, 2014]. NICE, O., 27th November 2014, 2014d-last update, NICE draft guidance recommends eculizumab (Soliris) for treating very rare life-threatening blood disorder [Homepage of NICE], [Online]. Available: https://www.nice.org.uk/news/press-and-media/nice-draft-guidance-recommends-eculizumab-soliris-for-treating-very-rare-life-threatening-blood-disorder [December 30th, 2014]. NORIS, M. and REMUZZI, G., 2010. Thrombotic Microangiopathy After Kidney Transplantation. American Journal of Transplantation, 10(7), pp. 1517-1523. NORIS, M., MESCIA, F. and REMUZZI, G., 2012. STEC-HUS, atypical HUS and TTP are all diseases of complement activation. Nature Reviews Nephrology, 8(11), pp. 622-633. NORIS, M. and REMUZZI, G., 2013. Managing and preventing atypical hemolytic uremic syndrome recurrence after kidney transplantation. Current opinion in nephrology and hypertension, 22(6), pp. 704-712. PICKERING, M. and COOK, H.T., 2011. Complement and glomerular disease: new insights. Current opinion in nephrology and hypertension, 20(3), pp. 271-277. PONTICELLI, C. and BANFI, G., 2006. Thrombotic microangiopathy after kidney transplantation. Transplant International, 19(10), pp. 789-794. RATHBONE, J., KALTENTHALER, E., RICHARDS, A., TAPPENDEN, P., BESSEY, A. and CANTRELL, A., 2013. A systematic review of eculizumab for atypical haemolytic uraemic syndrome (aHUS). BMJ Open, 3(e003573),. RICHARDS, A. and KAVANAGH, D., 2009. Pathogenesis of Thrombotic Microangiopathy: Insights from Animal Models. Nephron Experimental Nephrology, 113, pp. e97-e103. SCHMIDTKO, J., PEINE, S., EL-HOUSSEINI, Y., PASCUAL, M. and MEIER, P., 2013. Treatment of Atypical Hemolytic Uremic Syndrome and Thrombotic Microangiopathies: A Focus on Eculizumab. American Journal of Kidney Diseases, 61(2), pp. 289-299. SOLIRIS, P., 2014-last update, Soliris (Eculizumab) PRESCRIBING INFORMATION [Homepage of Alexion Pharma], [Online]. Available: http://alexionpharma.com/Documents/soliris_pi-4-2014.aspx [December 30, 2014]. SPIEGELHALTER, D., 2nd January 2015, 2015-last update, David Spiegelhalter’s Personal Home Page. Available: http://www.statslab.cam.ac.uk/Dept/People/Spiegelhalter/davids.html [January 3rd, 2015]. STANTON, D., 5th March 2014, 2014-last update, Alexion quizzed over Soliris’ £360,000 price by NICE – why does Eculizumab cost thirty times that of other monoclonal antibodies? [Homepage of Biopharma-reporter.com], [Online]. Available: http://www.biopharma-reporter.com/Markets-Regulations/Alexion-quizzed-over-Soliris-567-000-price-by-NICE. STREET, C.G., 3rd January 2015, 2015-last update, Alabama Rot in dogs – clusters in New Forest, Greater Manchester & Surrey. Available: http://understandinguncertainty.org/user-submitted-coincidences/alabama-rot-dogs-clusters-new-forest-greater-manchester-surrey [January 3rd, 2015]. STREET, C.G., 30th December 2014, 2014c-last update, UK map of Alabama Rot (CRGV) cases in dogs since 2012. Available: https://www.google.com/maps/d/edit?mid=zIJgTtl9x6zk.kif7awTR9hAA. WALKER, D., 2014a-last update, ‘Alabama Rot’– the veterinary view from the British Small Animal Veterinary Association & Small Animal Medicine Society [Homepage of BSAVA], [Online]. Available: http://www.bsava.com/News/tabid/315/ArticleID/68/Default.aspx [December 31st, 2014]. WALKER, D., 2014b-last update, ‘Alabama Rot’: Update From The British Small Animal Veterinary Association & Small Animal Medicine Society (incl. 8 refs) [Homepage of Small Animal Medicine Society], [Online]. Available: http://www.samsoc.org/component/content/article/27-veterinary-medicine-society/67-alabama-rot-article [December 31st, 2014]. WALKER, D., 2014c-last update, IMPORTANT INFORMATION REGARDING DOGS WITH ACUTE KIDNEY INJURY (‘ALABAMA ROT’). Available: http://www.andersonmoores.com/vet/news [February/7th, 2014]. WALKER, D., 2014d-last update, More about Alabama Rot – includes references. [Homepage of British Small Animal Veterinary Association (BSAVA)], [Online]. Available: http://www.bsava.com/Portals/4/knowledgevault/resources/files/News_More_about_Alabama_Rot_240114.pdf [December 31st, 2014]. WALKER, D., November 2014, 2014e-last update, What is idiopathic cutaneous and renal glomerular vasculopathy (‘Alabama rot’)? [Homepage of Anderson Moores], [Online]. Available: http://www.theveterinaryexpert.com/alabama-rot/alabama-rot/ [December 31st, 2014]. WALKER, D. and LAKE, C., 2014-last update, Update on Alabama Rot at NFDOG AGM. Available: www.carolake.com/CRGV.doc [December 31st, 2014]. 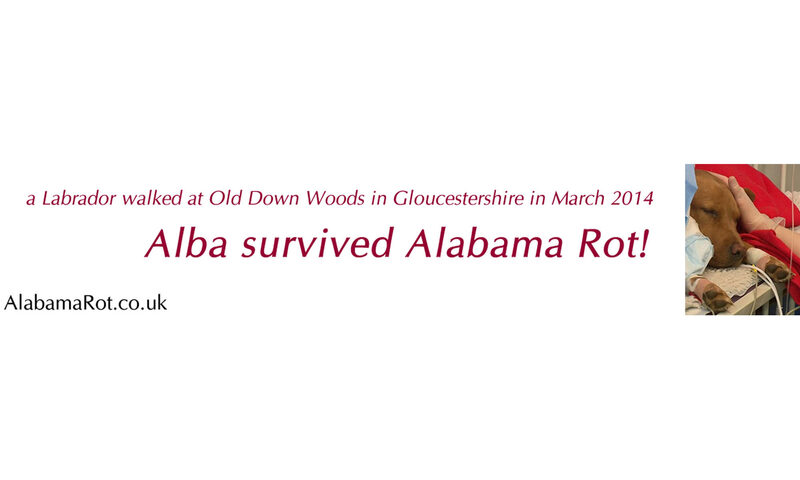 WALKER, D. and SHERWOOD, C., 26th October 2014, 2014-last update, Update on Alabama Rot at NFDOG AGM. Available: http://www.woodgreenvillagenews.org.uk/localnewspages/localnews-2011to2020/ongoingnews/mysterydogillness.htm [December 31st, 2014]. WATERS, A.M. and LICHT, C., 2011. aHUS caused by complement dysregulation: new therapies on the horizon. Pediatric Nephrology, 26(1), pp. 41-57. YENIGUN, E.C., BARDAK, S., PISKINPASA, S.V., OZTURK, R., TURGUT, D., KOC, E. and DEDE, F., 2012. Acute Thrombotic Thrombocytopenic Purpura Following Orthopedic Surgery: Case Report and Review of the Literature. Renal failure, 34(7), pp. 937-939. ZUBER, J., FAKHOURI, F., ROUMENINA, L.T., LOIRAT, C., FREMEAUX-BACCHI, V. and FRENCH STUDY GRP AHUS C3G, 2012. Use of eculizumab for atypical haemolytic uraemic syndrome and C3 glomerulopathies. Nature Reviews Nephrology, 8(11), pp. 643-657. ZUBER, J., LE QUINTREC, M., SBERRO-SOUSSAN, R., LOIRAT, C., FREMEAUX-BACCHI, V. and LEGENDRE, C., 2011. New insights into postrenal transplant hemolytic uremic syndrome. Nature Reviews Nephrology, 7(1), pp. 23-35. A 30ml vial contains 300mg Eculizumab. Assuming dose for dogs is same as for people, for a 10-20kg dog (Soliris 2014) (Table 1) dose is 600mg week 1, 300mg week 2, then 300mg every 2 weeks – total 28 vials x £3150 = £88,200 per dog per year. 30 dogs would cost £2.64M in the first year.